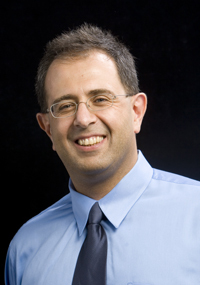 Professor Reza Ghodssi (ECE/ISR) has been elected a Fellow of the Institute for Electrical and Electronics Engineers, (IEEE) effective Jan. 1, 2015. The citation reads, "for contributions to materials and processes for microsystems technologies." Dr. Ghodssi is the Herbert Rabin Distinguished Chair in Engineering within the A. James Clark School of Engineering and is the director of the Institute for Systems Research. He is also affiliated with the University of Maryland’s Fischell Department of Bioengineering, the Maryland NanoCenter, the University of Maryland Energy Research Center (UMERC), and the Materials Science and Engineering Department. Dr. Ghodssi's research interests are in the design and development of microfabrication technologies and their applications to micro/nano devices and systems for chemical and biological sensing, small-scale energy conversion and harvesting, and engineering systems for mental health.